Bali is the Island of the Gods which is eminent for its natural beauty, its culture, and its friendly people. With the scenic views of rolling hills and mountains, a steep coastline beaches with soft white or black sand, lush rice paddies which adds to the aura of serenity. A colorful culture, unique tradition, and deeply spiritual religion, it’s all a common secret why Bali renowned as The Island of The God and a One Thousand Temple Island. Everything makes Bali’s background are exciting and its promises happiness. Bali deserves to be heaven on earth. In the daily life of the Balinese people, they are guided by the rules that apply in the community. In addition, the Balinese people also guided by the calendar when they would do something new like starting business, wedding ceremony, cutting hair, and so on. Bali has its own calendar that contains the dates of a big day in Indonesia, horoscope, public holiday and also contains about the Hindus region ceremony and a good day to do something or start something new, complete with the prediction of human character based on the birth of Bali. The Balinese calendar is the dating system used by Balinese Hindus on the Bali Island. The Balinese calendar can be considered special because of the Saka Bali calendar is the “convention” calendar. Not as absolute astronomical as the Hijri calendar, but it is not like the Javanese calendar, but ‘roughly’ is in between that calendar. 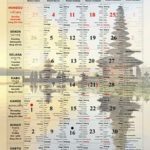 The Saka Bali calendar is not the same as the Saka Calendar from India, but the Saka calendar has been modified and added with local elements. The New Year for Calendar Saka Bali is celebrated by Nyepi day (The day of silence), as one of a big Hindu ceremony. The Balinese Calendar also contains “Dewasa Ayu” which means a good day to do something or starting something new. On this year, 2018, a good day to start planting rice is on: 16 & 31 January, 9 & 15 February, 2 & 11 March, 1, 4, 20 April, 16 & 31 May, 9, 15, 30 June, 9, 15, 30 July, 8 August, 7 & 14 September, 7, 13, 28 October, 12 & 27 November, and 6, 12, 27 December. Other examples of The Balinese Calendar are a good day to build a home, temple, and then a good day to start a business, a good day to raise animals, a good day to celebrate wedding ceremony, and celebrate other Balinese ceremonies.